CAUTION: This shock is pressurized to 250 psi nitrogen. The pressure is not an adjustable feature of the shock. Unless the reservoir bladder assembly leaks, the shock should not normally lose pressure. If, after an extended period of time or number of miles, the damping becomes soft or mushy, the shock may need to be serviced which includes shock oil and a nitrogen charge. In this situation, re-pressurizing the shock alone may not improve the action of the shock. The shock should be returned to Works Performance Products, Inc. or to a qualified shop that has the appropriate tools, training and nitrogen handling equipment. Works Performance Products, Inc. constructs two types of shocks for the ST1100. Both have an integral reservoir (often referred to as a “piggyback” reservoir). This reservoir increases the shock fluid capacity. This additional fluid helps dissipate heat generated by the damping in the shock. 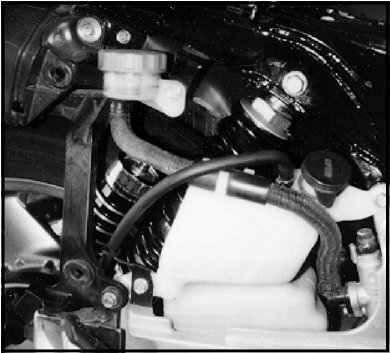 The reservoir contains a polyurethane bladder which separates the nitrogen from the shock oil. The shocks differ in the external adjustments. The Racer shock features a large 1.375” damping piston and Works’ exclusive check-ball and orifice damping system. This damping system allows an extremely wide range of damping through the high-, medium- and low-speed circuits that are incorporated in the design. It has spring pre-load adjustment to change the ride height to accommodate changing loads. 1. Place the motorcycle on the center stand. Remove the seat and the right side panel from the motorcycle. 2. Remove the lower shock mounting bolt first. A wedge may be needed under the rear tire to free the bolt. The swingarm will drop at this point. 3. Remove the top shock bolt and withdraw the shock towards the rear of the motorcycle. 4. Make sure that the two-piece bushings are in place in each of the eyelets of the Works Performance shock. NOTE: Do not try to install the shock with only one half of the bushing set, as this will lead to poor performance and remature seal leakage. For the same reasons, do not grind or file the inner or outer edges of the bushing to make them narrower. The amount of “float” in the bushing set is necessary to ensure smooth operation of the damper assembly. FIG. 1: ST1100 SHOCK MOUNTING ORIENTATION. SHAFT POINTS UP AND RESERVOIR IS TO THE REAR. 5. The shock mounts with the reservoir towards the rear of the motorcycle and at the bottom of the shock. This means that the shock shaft will point up and the threaded post and large preload nut will be accessible at the top. 6. Install the shock eye in the upper mounting channel. Install the mounting bolt and nut finger tight. 7. Pull the shock towards the rear of the motorcycle and raise the swingarm to engage the lower shock eye. The rear wheel wedge will be helpful here. The shock body can be twisted in either direction to line up the bushings with the channel, should it not be oriented exactly in line. 8. Install the lower shock mounting bolt and nut. 10. 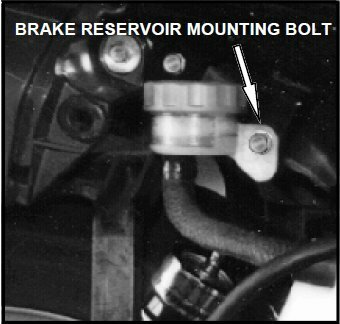 Install one or more (as necessary) of the 6mm flat washers supplied with the shocks under the head of the bolt that secures the brake master cylinder reservoir to the frame (Fig. 2). Ideally, the end of the bolt should be flush with the captured nut on the frame. In some cases the bolts are longer than necessary and will contact the edge of the shock reservoir when the shock is fully bottomed. 1. Place the seat in position so that the rider can sit on the bike. Leave the side panel off so that you can access the preload nut on the shock. 2. With the bike still on the stand, have an assistant measure the distance from a point on the rear axle to a point on the frame directly above it. Record this measurement. 3. Take the bike off the center stand, and have the rider bounce on the suspension a few times and then let the bike settle. With the rider still in place, have the assistant measure between the same two points on the axle and frame. Subtract the second measurement from the first. For the stock length shock, the difference should be between 1-1/4 inches (minimum) to 1-5/8 inches (maximum). (The short shock range is 3/4 inch to 1 inch.) If it falls within this range, no adjustment is necessary. 4. If it is less than the minimum, unscrew the nut about one turn. (These adjustments are most easily made with the bike on the center stand.) Check the measurement again by repeating Steps 1 - 3. 5. If the measurement exceeds the maximum, screw the nut down about one turn. Check the measurement again by repeating Step 13. Continue to adjust as necessary to achieve the correct ride height. 6. To adjust for the additional weight of a passenger, turn the nut down enough turns to restore the bike to the correct ride height. Once you have done this once, remember the number of turns you made so you can quickly make the changes before a ride. 7. Replace seat and side panel. FIG. 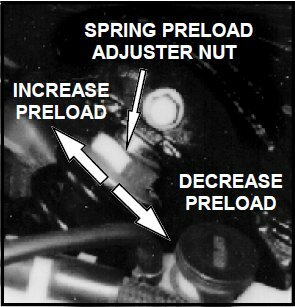 3: ADJUSTING SPRING PRELOAD WITH THE ADJUSTER NUT. PDF version is attached below.